Experts and novices shape a journey through foundational content toward professionalism. With a bright and engaging writing style that enlists the voices from experts as well as novices, Becoming a Teacher explores what it means to be a professional teacher in today’s climate of accountability, high-stakes testing, and changing legislation. Fully revised, the Tenth Edition explores the changing field of education, outlining ways to be an agent of change in the profession, pinpointing meaningful uses of technology in education, clarifying realities of school and classroom diversity, and clearly outlining past, present, and future thoughts on curriculum, instruction, management, philosophy, and issues in education. This straightforward approach provides students with the tools and information necessary to answer the questions, “What does it take to become a high quality teacher?” and “Do I want to teach?” Along the way, the author provides practical perspectives for meeting the challenges of teaching. Organized into four parts, the book addresses both functional and foundational topics to give readers a well-rounded view of the teaching profession. The Enhanced Pearson eText features embedded video, assessments, and audio clips. 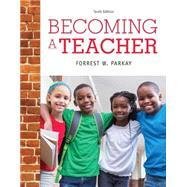 Forrest W. Parkay is Professor of Educational Leadership and Higher Education at Washington State University. He was Professor of Educational Leadership at the University of Florida for eight years and at Texas State University for five years. Forrest received his B.A. and M.A. degrees in English education from the University of Illinois-Urbana. He earned his Ph.D. in education at the University of Chicago, and he is a graduate of Harvard University’s Management Development Program (MDP). For eight years, Forrest taught at DuSable High School on Chicago’s South Side, and he served as Chairman of DuSable’s English Department for four years. Forrest is the author or co-author of more than 60 refereed journal articles and several books, including Curriculum Leadership: Readings for Developing Quality Educational Programs (Allyn & Bacon, 2010). His research has appeared in the field’s leading peer-reviewed journals, including Phi Delta Kappan, American Journal of Education, and Educational Administration Quarterly. A former Fulbright Scholar at Kasetsart University’s Center for Research on Teaching and Teacher Education, in Thailand, Forrest has facilitated educational reform programs and conducted cross-national research in China, Thailand, Korea, Japan, Pakistan, India, and Singapore. He has been a Visiting Professor at Beijing Normal University and at Assumption University in Thailand. His hobbies include classic cars, camping, kayaking, and photography. Forrest is the proud father of four daughters: Anna, Catherine, Rebecca and Anchitta. What Are the Benefits of Teaching? What Are the Challenges of Teaching? What Will Society Expect of Me as a Teacher? What Can You Learn from Observing in Classrooms? Why Is Your Induction into Teaching Important? How Can You Gain Practical Experience for Becoming a Teacher? How Will I Become a Highly Qualified Teacher? How Can You Benefit from Having a Mentor? What Do Teachers Do in the Classroom? What Knowledge and Skills Do Today’s Teachers Need? To What Extent Is Teaching A Full Profession? To What Professional Organizations Do Teachers Belong? How Are Teacher Leaders Transforming the Profession of Teaching? What Is the Role of Schools in Today’s Society? How Can Schools Be Described? What Are Schools Like as Social Institutions? What Are the Characteristics of Successful Schools? What Social Problems Affect Schools and Place Students at Risk? How Are Schools Addressing Societal Problems? How Can Community-Based Partnerships Help Students Learn? Why Is Philosophy Important to Teachers? What Is the Nature of Philosophy? What Determines Your Educational Philosophy? What Are the Branches of Philosophy? What Are Five Modern Philosophical Orientations to Teaching? What Psychological Orientations Have Influenced Teaching Philosophies? How Can You Develop Your Educational Philosophy? Why Is Educational History Important? What Were the European Antecedents of American Education? What Were Teaching and Schools Like in the American Colonies (1620–1750)? What Were the Goals of Education During the Revolutionary Period (1750–1820)? How was the Struggle Won for State-Supported Common Schools (1820–1865)? How Did Compulsory Education Change Schools and the Teaching Profession (1865–1920)? What Were the Aims of Education During the Progressive Era (1920–1945)? How Did Education Change During the Modern Postwar Era (1945–2000)? What Are the Educational Priorities of the New Century (2000–the Present)? Why Do You Need to Understand Educational Politics? How Does the Local Community Influence Schools? What Powers and Influence Do States Have in Governing Schools? How Do Regional Education Agencies Assist Schools? How Does the Federal Government Influence Education? What Role Do Teacher Leaders Play in School Governance? How are Schools Financed in the United States? What Are Some Trends in Funding for Equity and Excellence? How Is the Privatization Movement Affecting Equity and Excellence in Education? Why Do You Need to Know About Education and the Law? Why Do You Need a Professional Code of Ethics? What Are Your Legal Rights as a Teacher? Do Student Teachers Have the Same Rights as Teachers? What Are Your Legal Responsibilities as a Teacher? What Are the Legal Rights of Students and Parents? What Are Some Issues in the Legal Rights of School Districts? How Is Diversity Reflected in the Culture of the United States? What Does Equal Educational Opportunity Mean? What Is Meant by Bilingual Education? How Is Gender a Dimension of Multicultural Education? How Do Students’ Needs Change as They Develop? How Do Students Vary in Intelligence? How Do Students Vary in Ability and Disability? What Are Special Education and Inclusion? How Can You Teach All Learners in Your Inclusive Classroom? What Determines the Culture of the Classroom? How Can You Create a Positive Learning Environment? What Are the Keys to Successful Classroom Management? What Teaching Methods Do Effective Teachers Use? How Do Teachers Help to Build Learning Communities? How Do Teachers Participate in Teacher Collaboration? What do Students Learn from the Curriculum? How is the School Curriculum Developed? What Influences the Curriculum Development Process? What Role will Standards Play in Your Classroom? How is Standards-Based Education Shaping School Curricula? How is the Common Core State Standards Initiative Changing U.S. Education? What Controversies Surround the Effort to Raise Standards? What is the Role of Assessment in Teaching? How are Standardized Assessments Used in Education? What are “High-Stakes” Tests and Accountability? What Methods will You use to Assess Student Learning? What are Emerging Trends in Classroom Assessment? How can you Develop High-Quality Classroom Assessments? How is Technology Transforming Teaching And Learning? What Digital Technologies Can Be Integrated Into Teaching? How Available and Frequently Used are the Latest Technologies in the Classroom? What Does Research Say about Technology Integration and Student Learning? What are the Challenges of Integrating Technology into Teaching?